faithparent: Is Siri Smarter than a Parent? At first glance it appears that this little girl is holding a conversation with a phone. She talks to Siri and is delighted when Siri talks back. She even understands what is said and responds appropriately. It might be easy to assume that this child is developing language skills by interacting with a phone. Take another look at the video. 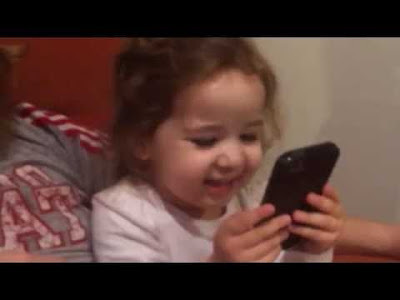 After each time she interacts with Siri, she tells her parents about it. She has to interpret what is said as if her parents didn’t hear. Her actions of playing with the phone fit into a separate world than her conversation with her parents. The phone may be amazing, but it is not worthy of real conversation. Our children want, and need, our real conversation. The kind of conversation that happens when you are telling a story, answering a question, analyzing the school day, helping with homework, reading or working together. This conversation develops language skills, social skills, and thinking skills. Not to mention the fact that you are building up serious relationship points that you will want to have banked for when your child becomes an adolescent. A teenager will be more likely to talk with a parent who has spent previous years in conversation. Talks between teenagers and parents can make all the difference on the trajectory of the life of an adolescent. Voice command technology, such as Siri and Alexa have much potential to change the way we live our lives, but they will never replace conversation between parent and child. It's one thing to let Google Home answer a tough science question. It's a totally different thing to let Siri be the one to say "I love you" to your child. Nothing replaces a parent. Talk to your child; even if you don’t know all the answers. This is how you share yourself. This is how you share your faith and your values. This is how your child grows into the adult he or she is meant to be.